Intersound’s Annual Guitar Show is always a fantastic event, featuring trade stands from many of our suppliers, and demonstrations from some fantastic guitarists. This year’s show is going to be the biggest event we’ve ever put on, twice as much room, loads more displays, more special guests and to top it all off we’re going to be celebrating 20 years of Intersound! We’ll have our usual array of first class performers throughout the evening to demonstrate some of the amazing guitars at the show. We’re delighted to say that once again we’ll be joined by the legend that is Elliot Randall, our good friend Jamie Moses, and this year, visiting us for the first time will be Rod Stewart’s guitarist Jim Cregan! 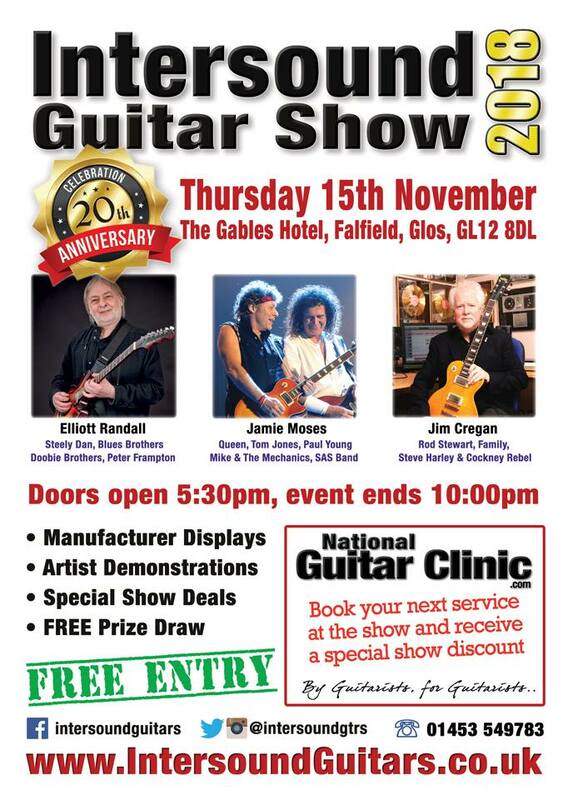 As always this is a free entry event, but do make sure you complete your details for the FREE prize draw where you could win a great prize, including a free guitar!